Once, when we were walking somewhere on the monastery grounds, I asked him, "Fr. Seraphim, what's your favorite icon of the Mother of God?" (That's the kind of question converts like to ask, you know.) He stopped and said, "I don't have one." "That's impossible!" I said. "Everyone has a favorite icon of the Mother of God. Which one is yours?" He paused again and looked at me, actually with astonishment, and he said, "Don't you understand? It's the whole thing." That was a very profound answer: you can't just pick out one thing and say this is the best thing, or this is my favorite. It truly is everything! A talk given on the twentieth anniversary of the repose of Hieromonk Seraphim Rose, September 2, 2002, at the St. Herman of Alaska Monastery, Platina, California. I have a heart that’s overflowing. The last time I was here at the monastery was seventeen years ago, in the spring of 1985. My remarks today are not formal because I didn’t want to make a scholarly, academic presentation. Rather, I think that what you want to hear from me is something really very personal. I first met Fr. Seraphim in the spring of 1966. He was then a lay Reader, Eugene Rose. Vladika John (St. John Maximovitch of Shanghai and San Francisco) was still alive, and Eugene and Gleb (later Fr. Herman) had their bookstore a couple of doors down from the Cathedral in San Francisco. Having been born and raised Roman Catholic, I was at the very beginning of my journey into Orthodoxy, but at the time I didn’t know it. A friend of mine had discovered the bookstore and told me they had beautiful icons and incense for sale. So I went by, and Fr. Seraphim was there. All the stories you hear about him are really true. He was very tall; he had the largest eyes of anyone I had ever known—penetrating eyes, which were at the same time very warm and calming. He didn’t have his famous beard yet—so I’m one of the few people here that knew him when he was beardless. I remember him standing behind the counter as I came in—I was being very silly and frivolous, I’m sure—and engaged him in conversation. As you know, he wasn’t much for small talk, but there I was in his shop, talking, when suddenly, as soon as he realized I was a Roman Catholic, he said, “You know, you Roman Catholics don’t understand the Mother of God.” I was very taken aback by this because I didn’t know what the Orthodox teaching was about the Mother of God. He then proceeded, on the spot, to instruct me in the errors of the Roman Catholic Church with regard to the Mother of God, as well as many other things. That was my first exposure to him! You see, he was in fact teaching me, feeding me spiritually, from the first minute of the first encounter. My first visit here to the monastery was in 1970. I had been Orthodox about four or five months. We were living in Etna, three hours north of here, and had been there for several years. We lived far from any Orthodox church. At that time the nearest parish of any jurisdiction was in Sacramento or San Francisco. Because the fathers here were not ordained yet, there were no sacraments available for us here except when a priest or bishop would visit the monastery. On those occasions Fr. Seraphim would send a note letting us know that there was going to be a Divine Liturgy. Otherwise we made a seven-hour trip each way when we went to the city, which we tried to do once a month. But I corresponded with Fr. Seraphim even before coming into the Orthodox Church. He invited me to come for a visit in the fall of 1970. I remember it very well because although it was a little bit later than this time of the year, it was very hot and my car somehow got stuck down the road. My first visit here, then, was thirty-two years ago. I was thinking about that when I arrived here yesterday. I was thinking that many of the people I am meeting here this weekend, especially the young people, weren’t even alive when I came the first time in 1970, and I thought how delightful it is to see other generations now coming and receiving something of what was given to us, and believe me when I tell you that we were given so much. I told someone yesterday that this monastery was the “mother- lode” for us. This was “Camelot.” We received all of our spiritual formation here, because we were too far from a parish. Everything we learned came from Fr. Herman and Fr. Seraphim. It wasn’t until after Fr. Seraphim’s repose that I realized this wasn’t what everyone was given everywhere else. I had thought it was, and so this was a huge shock to me. I also realized that we were given something very special and precious, and that we had to preserve and live up to it. Probably we didn’t do a very good job, but we did know that we were being given a treasure. Prior to Fr. Seraphim’s repose, of course, I had been here many times. I was here for Fr. Seraphim’s funeral and I was also at the hospital earlier on. In fact, I had the privilege of bringing him Holy Communion in the hospital on the Feast of the Dormition. As you know, he reposed a few days later. At that time, when we were all here for his funeral, it all seemed very unreal. It was not possible that he was gone. Fr. Seraphim died on Thursday morning and was buried on Saturday morning. I came up Thursday afternoon. When I arrived at Mrs. Harvey’s house in Redding, Fr. Vladimir Anderson’s son Basil was building the coffin. From there we came right up to the monastery. I stayed with Fr. Seraphim in the church that whole night, as he lay in his coffin. Others were coming and going. There was, of course, no electricity. just candlelight. Periodically I would rouse myself and serve another Pannikhida. I remember looking at him and thinking, “He’s not gone. This is impossible!” And I remember especially looking at his right hand, and thinking that this hand would never be raised to bless me again. So I lifted his hand and blessed myself with it one last time. So that was the end, in this world, of my relationship with him. But I always pray to him. I pray for him, commemorate him, but in my private prayers I always pray to him, because I believe that he is in the Kingdom of Heaven, and I believe that spiritual fathers in the other world still affect their spiritual sons in this world. I’ve dreamt about Fr. Seraphim many, many times. The last time was several years ago. In my dream I was back here, and it was the summer before he died, during the Pilgrimage and the summer courses of the New Valaam Theological Academy. (He died just a few weeks after that.) In my dream I saw him here at the monastery and I thought, “Oh, he hasn’t reposed yet, and now I can talk to him about all those things that I really need to talk to him about.” But then I realized that he had in fact died. I woke up weeping because I knew he was gone. And yet, somehow he was in the room with me, too. I knew he was there; in some unimaginable way he had reached out from the other world just as a point of momentary comfort and consolation. Usually I give, as I said, a very formal talk, but I’m speaking today from my heart, informally, because I hoped Fr. Seraphim would inspire me to say what he would want you to hear. I decided that the most important things for me to tell you about are the principles of how to live an Orthodox life, which I learned not from his books so much as from what he told me in different conversations here over the years. The first of these principles is: “We are pilgrims on this earth and there is nothing permanent for us here.” We must constantly remind ourselves of that. We are just sojourners. This life is but the beginning of a continuum that will never end. We tend to treat it as though it’s permanent and awfully important in terms of careers and education and getting ahead and all those things. But all of that will die with us when the body dies; none of it will go with us into the next world. Fr. Seraphim wanted to teach us principles that would stand us in good stead throughout life and sustain us in new and different situations, circumstances, and problems. Therefore, if you went to him with a question about a particular matter, he might or might not address that specific problem, but he would give a principle by which one could evaluate the problem oneself and come to a reasonably sober and reliable conclusion. This is what was behind his reminding us that we’re pilgrims on this earth. This is a principle, a premise. Let us consider all the problems that we’ve encountered in the last week or month, all the things in our private lives that seem very important and get us riled up, upset, worried, or threatened; and then let us think about how, if we had reminded ourselves that we’re just pilgrims here and that most of our “issues” are very unimportant, what a difference that would have made in the quality of our day, our week, our life. Once, when we were walking somewhere on the monastery grounds, I asked him, “Fr. Seraphim, what’s your favorite icon of the Mother of God?” (That’s the kind of question converts like to ask, you know.) He stopped and said, “I don’t have one.” “That’s impossible!” I said. “Everyone has a favorite icon of the Mother of God. Which one is yours?” He paused again and looked at me, actually with astonishment, and he said, “Don’t you understand? It’s the whole thing.” That was a very profound answer: you can’t just pick out one thing and say this is the best thing, or this is my favorite. It truly is everything! On occasions like this, Fr. Seraphim was able to remind me over and over again that Orthodoxy is to be lived, not just read, studied, or written about. In this connection, Fr. Seraphim told me that I should not be ashamed of my ethnic background. When he discovered that I was going to make a trip to Britain in 1976, he became very excited and gave me the names and addresses of many subscribers of The Orthodox Word in Britain whom he wanted me to contact, and in fact I was able to contact some. But more than that, he said, “You must go and see what’s still there of the ancient pre-schism Orthodox holy places.” Until that moment I had never particularly thought about this. I’m of Scottish descent, so I have Celtic blood. I suppose it had occurred to me that if one went back far enough, my ancestors were Orthodox, but I hadn’t thought about it very much until then. Fr. Seraphim told me, Go to this place, go to that place. He gave me a list of places, and also a list of saints, so that I could find out more about them and perhaps even discover some books about them. When Fr. Seraphim began writing about Orthodoxy in the pre-schism West, and as Vita Patrum was first being published in serial form, we began to learn about the similarities between the East and the West in the first thousand years of Christianity. We learned that the feeling and tone—and in some cases even the appearance—of the Church in the West was almost identical to that of the Church in the East. So, because of Fr. Seraphim, I learned that Orthodoxy is not an academic thing, it’s a living thing. And I learned that part of making it a living thing was to discover my own origins, and that of my pre-schism Orthodox ancestors. A third principle was probably the most important of all. Fr. Seraphim told me, “If you do not find Christ in this life, you will not find Him in the next.” For a Westerner, this is an astonishing statement. What does this mean, practically? He wasn’t talking about mystical experiences or having visions or something of that nature. Anyone who knows Fr. Seraphim realizes he would have stayed far away from that kind of talk. ‘What he meant by “finding Christ in this life” is this: that one must first keep one’s focus on Christ all the time, day in and day out. This is not just to have a routine of prayer, not just to tip one’s hat to the icons as one goes out the door. Rather, it’s to bring to mind Christ all day long in every circumstance, in every opportunity—to raise one’s heart and mind to Him. Fr. Seraphim used to say to me, quoting from the New Testament: God is love; and he that dwells in love dwells in God, and God in him…. Perfect love casts out fear (1 John 4:16, 18). You see, I was a fearful person, so he would say things like that. And then he would explain, “Well, we can’t have perfect love for God or anyone else because we’re imperfect. God’s love is perfect. But if we dwell in love and God is love, then God is dwelling in us. And that is one of the ways by which we become closer and closer to Christ in this world.” And this is how we become less fearful of life and other people, of challenges and difficulties. Other verses he liked to quote were Little children, it is the last time (1 John 2:18), and Fear not, little flock, for it is your Father’s good pleasure to give you the Kingdom (Luke 12:32). In subsequent years I remembered Fr. Seraphim repeating such verses to me; and they came back to me in times of fear and distress. These verses were a particular comfort and consolation to me at the time of my Matushka’s sudden repose, which occurred several years after Fr. Seraphim left this world. But, of course, the greatest comfort of all at the time of her death was that I knew she was now with him. In conclusion, I would like to say, with utmost conviction, that Fr. Seraphim did find Christ in this life. You can’t give what you don’t have, and he had so much to give. By this we can know that Christ truly dwelled within him. And how did he find Christ in his life? I believe, first of all, that he kept his eyes fixed on Christ simply by doing his duty at every moment of every day, and never shirking it. A year or so before his repose, I drove Fr. Seraphim someplace where he was going to give a talk. We got out of the car and, as he was walking in front of me, he turned and said, “You know, this is really not for me.” Now this is interesting because many think that he was really coming into his own, so to speak, in the last years of his life. And surely, in a sense, that’s true. But there was also a part of him that never really loved it at all, because he wanted to just be in the monastery. He did the work of missionary outreach because he knew God was calling him to it. It was his duty. Also, he kept his eyes fixed on Christ by not paying much attention to himself. Fr. Damascene spoke about this very well in his remarks when he said that Fr. Seraphim had essentially ceased to have a private life, that he didn’t belong to himself. That was really true. Fr. Damascene also spoke about Fr. Seraphim’s attitude toward food. I hadn’t heard the mashed potato story before—that was wonderful. But I remember once asking Fr. Seraphim what was his favorite food, and he didn’t answer me. He didn’t even say, “I don’t have any”; he just changed the subject! Once, when he was coming to visit our home, someone had found out from Fr. Herman that there was, after all, something Fr. Seraphim liked. I don’t now recall what it was, but my wife fixed this for him—and I thought, “This will really please him.” So a place was put in front of him with what we believed was his favorite food, and he never paid any attention to it. He didn’t even seem to notice that the plate was in front of him. That was it. So Fr. Seraphim did his duty in every single moment, and he kept his eyes fixed on Christ and on others, not on himself. And I believe that now, as a result of a life lived so unselfishly in that way, he does indeed now rest serenely and eternally in the arms of Christ, ‘Whom he spiritually beheld day after day, week after week, month after month, and year after year, here on this mountain. Because of his example, we not only have a model, but we have an inspiration, and we have the encouragement to do just a little bit more than we’re doing now. Once I was giving a talk about St. John of San Francisco, and someone said, “Well, this is all very wonderful, but, you know, I couldn’t go without sleeping in a bed for forty-two years!” And I said, “Okay, but could you start by just getting to church on time?” It’s the same thing with Fr. Seraphim. Fr. Seraphim was a great ascetic. Quite beyond most of us. But we could just start by keeping our eyes on Christ, as he did. We could pay a little more attention to what is supposed to be the center and focus of our very being all the time: our Lord and Savior Jesus Christ. If we do that, if we are inspired to do just a little bit more each day than we did before, then Fr. Seraphim’s legacy truly continues to live on. And really, basically, that’s what Orthodoxy is all about. Orthodoxy is so rich. It has such beautiful externals, which are not just entirely externals—they also partake of the essence of Orthodoxy, of course. But it’s very easy, Fr. Seraphim used to tell me, to get distracted by these externals. It’s very easy to think that, because we are following all the fasting rules and because we know the Typicon and so forth, we are actually living an Orthodox way of life, whereas we may not be at all. If Christ is not there behind all that, then it’s a waste of time: it’s a beautiful waste of time, but it’s a waste of time nonetheless. For Fr. Seraphim, however, Christ was always there, behind everything. And when Fr. Seraphim breathed his last, Christ was there to receive his soul. Amen. From The Orthodox Word, Vol. 38, No. 5 (226—Sept.-Oct. 2002), pp. 233-241. Copyright 2001 by the St. Herman of Alaska Brotherhood, Platina, California. Used with permission. Thomas Anderson, the son of Fr. 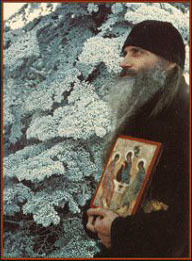 Vladimir Anderson of Willits, California, stayed here at the monastery off and on between the years 1972 and 1975. One thing that stood out in his memory from those years was Fr. Seraphim’s lack of concern for food. “Fr. Seraphim didn’t enjoy food or care what it tasted like,” Thomas told me not long ago. “He just ate to get enough energy to keep going, like fueling up a car. He ate whatever was put in front of him, without putting anything else on it, not even salt and pepper. And when it was his turn to cook, he pre-’ pared the most simple and basic food possible. When he cooked spaghetti, for example, it was just tomato paste and pasta, with no spices in the tomato paste.” How different is this image of Fr. Seraphim from what we know of his early, pre-Orthodox days as a gourmandizer!